Kolkata Souvenirs remind me of old Hindi films where the Hero or the father goes to Calcutta, as it was called then, and brings back gifts for his family. India and the world have always known Bengal for many lovely souvenirs including the mouth-watering sweets. I have had the opportunity to visit Bengal many times. We loved the Terracotta Temples of Bishnupur as much as we loved the jungles of Dooars. You cannot visit Bengal without exploring a bit of Kolkata every time. Each trip we picked up some souvenirs from Bengal and some came as gifts from our friends and associates. Let’s begin the list with something auspicious. 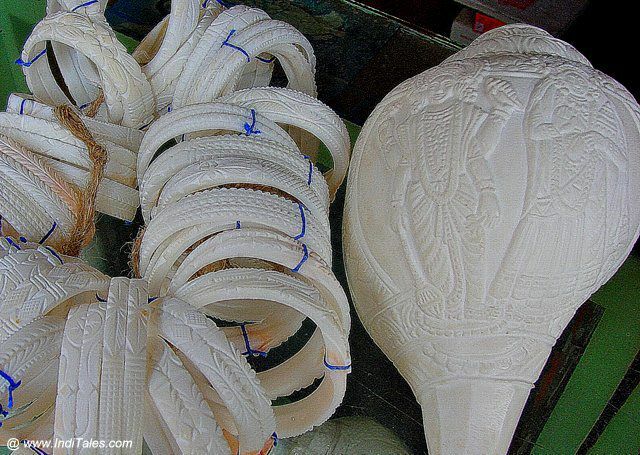 Conch shell carving is an art form that we saw closely in the lanes of Bishnupur. Artists would delicately hold the conch shell in his hands and chip off parts of it to reveal the hidden story. You can buy either the whole conch shell for your home or home temple or you can buy the conch shell bangles. Now, these bangles are worn by the married women of Bengal. However, there is no rule that says you cannot buy it for yourself or the women in your life. So, go ahead and but this most rooted in Kolkata Souvenirs. Notice the small horse figurines carved on these bangles – an ode to the Bankura horses. These bangles tend to be a bit odd shaped as they are carved out of natural shells. Enjoy the perfect work on the not so perfect shape. Bankura Horses – these horses with sharp tall ears can be seen all around Bankura district. You can get them in any size that you like. This would be a quintessential Bengali souvenir. They would look perfect near the entrance of your house or in the living room – standing like guests from Bengal. We picked up a set of Ganapati’s playing the various musical instrument – they now sit in my library – hopefully taking care of the obstacles that come our way. Terracotta Jewelry – Lately, artisans of Bengal have been carving small jewelry from terracotta. They paint them in vivid colors and you would have a hard time believing this is terracotta. I picked up a few terracotta earrings. Small in size and reasonably priced, they are a perfect gift to carry for all the girls in your life. Tant Saris – Saris that Bengali women wear every day with thick borders on an impossibly thin fabric. These are crisp thin Saris cotton Saris carrying the creativity of the famous weavers of Bengal. Traditionally you find them in soft pastel colors with bright colors used only for the patterns on the borders or small bootis on the Sari. These days, of course, the choice of colors and patterns has no limits. 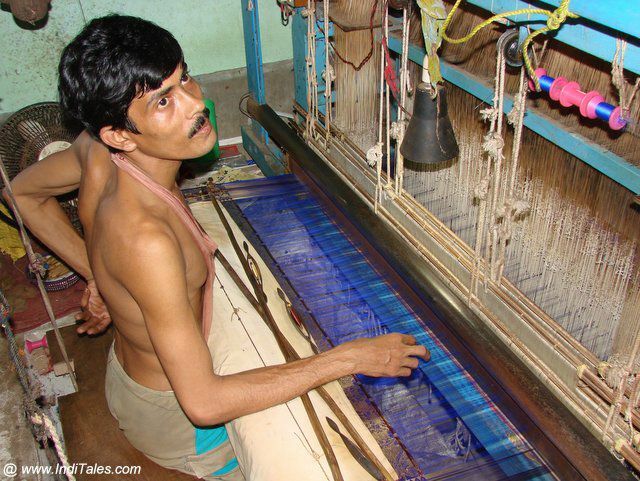 Dhaka, Tangail, Murshidabad are some towns famous for making Tant Saris. You can get them anywhere in Bengal – go to a local market for the best bargain. Baluchari or Swarnachari Saris – Baluchari Saris are the storytelling Saris in Silk. On raw silk, the weavers of Bankura weave the patterns they see on temples walls, on the borders, and on the Pallu. You can see Radha Krishna in a lovely pose or Krishna giving the sermon to Arjuna in the Mahabharata war or Radha playing with her Sakhis on a swing. The base color is of raw silk and the stories are woven with bright colors – red, green, purple. If the thread used for weaving is silk its called Baluchari and if it is gold it is called Swarnachari. Go pick up the story you want to adorn. Kantha Sari – This is an embroidered Sari instead of a woven one. On a plain Tussar Silk, the colorful threads are used to create patterns – usually, tradition motifs are used. SolaPith or Shola or Sola is the dried core of a plant that grows in marshy wetlands of Bengal. Milky white in color, it is soft and extremely lightweight. It is also called Indian Cork. You might have seen the face of Goddess Durga in the white material – it is carved from Solapith. Malkaras or the garland makers are the artisans who carve Shola – I assume they made garlands from Shola. You can also see Shola craft generously used during Durga Puja. Sometimes, Durga is crafted from Solapith, sometimes her adornments and sometimes the backdrop to her idol. 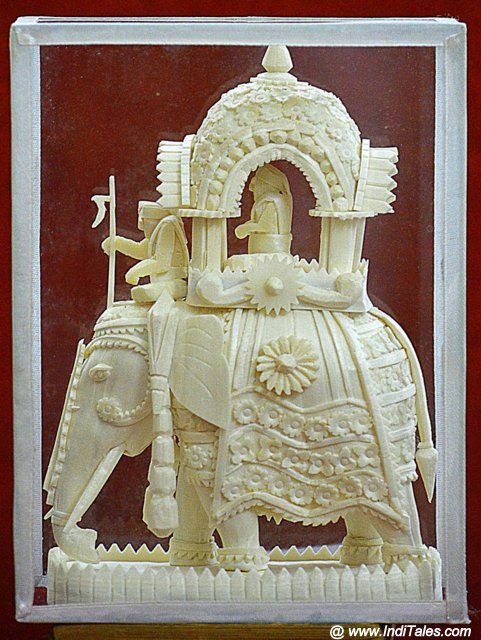 I have a beautiful elephant carved on Shola – if you do not pick it up or touch it – it can give an impression of being carved in ivory. Go buy this craft and play your role in keeping it alive. I think most Indian towns have a favorite sweet shop called Bengali Sweets. Rasgulla or Roshogulla as our Bengali friends call it is one of those sweets that you can have without any guilt for it has no oil. Then there is Sandesh and Cham Cham for those who like their sweets. Pati Shapta is something that a Bengali Aunty taught me how to make. Nolen Gur is the basic Bengali sweetness made from Palm Sugar. If you can just pop in a bit of it. Mishti Doi – that magically sweet curd is something only a sweet-toothed Bengali could have invented. To pack and bring back, I think Sandesh is the best bet. Dokra is a craft that is practiced the same way in the states of Bengal, Andhra, Telangana & Chhattisgarh – basically, states with a substantial tribal population. However, like all Indian Arts & Crafts, each region adds its unique touch to the art form. They make beautiful idols, everyday items like pen stands and panels depicting tribal life. In Bengal, I bought Dokra jewelry – my favorite Ganesh Earrings & pendant along with two Bangles – one carved in traditional design and other in a very contemporary design. You can, of course, buy a lot of souvenirs from Bengal to give a brassy look to your home or to just remind you of one of the oldest living metalcraft techniques in the world. If you travel through the hills of Darjeeling, you cannot miss those tea gardens on the rolling hills. It seems the tea leaves absorb the freshness of the hills that they later release in our tea cups. Pick up your tea leaves – first flush, second flush, black, green or in your favorite flavor. At Darjeeling, I picked up mint flavored tea that keeps me awake when I am writing long hours. There are lots of designer stores selling tea in both Darjeeling and Kolkata in interesting packaging. The Kalighat paintings originated in the vicinity of famous Kali Temple in Kolkata and hence borrows its name. Incidentally, this art form was born for souvenirs to be taken back home by the visitors of Kalighat temple. This means the themes of Kalighat Paintings were also related to Kali or other Indian deities, including the scenes from the epics Ramayana and Mahabharata. Slowly the artist started depicting contemporary themes as well as using the same techniques. There are quite a few online stores that sell them online – mostly as reprints. However, I would love to pick them in Kolkata – as a souvenir from the city where this art form was born. Bengal is the home of Jute industry. A lot of industrial products like ropes and gunny bags are made from jute. Thankfully, some creative souls make beautiful jute bags that can be used for everyday stuff. You can find them almost anywhere in Kolkata or even the rest of Bengal. Other Jute products to look out for are – Jute Baskets, Jute Shoes, Jute Table Cloths or Napkins. I think small jute bags would make great reusable gift wraps. Putul is the distorted word for Sanskrit word Puttalika – meaning puppet. Bengalis make these miniature dolls in clay and then paint them in vivid colors. I first saw a basket full of these dolls at an artist’s house in Bishnupur. They are made using the pressing and molding method. Sometimes different parts of the doll are molded separately and then pasted together. Going by the name I assume they were used as mini-puppets for some folk performances. I am unable to find any other use of them except that they look beautiful and add their beauty to your home. I think they would make a great Bengal souvenir as they are small, easy to carry and again carry the soil of Bengal in them. India, you never cease to amaze with your diversity or colors and your creativity. So, which are your favorite Kolkata Souvenirs? rabindra sangeet, the howrah bridge, the south calcutta, bally gunj, satyajit ray, etc,. r other bengali memoirs. durga puja celebr8ions whwrever there r 3 bengalese in other parts of india keep the bengali culture widespread. Bengali rock music is a genre that is little known outside the state. Between Bangladesh and West Bengal, the contemporary music scene has produced some awesome acts. This music is vibrant, global, intensely relevant, yet quintessentially Bengali. From socio-political ballads to songs of protest, from love songs to grunge, Bangla Rock has it all. This is embellished by the high level of musicianship that Bangla bands pride themselves for. This music is difficult to find outside the Bengali states. Makes for a great Kolkata souvenir, especially for the music lover in your life. Thanks, Subho for adding this lovely addition to the Kolkata Souvenirs. Can you also tell us where to find it in Kolkata or Bengal? Hope you enjoyed the Bengal Culture and thanks a lot for sharing with us these 10 souvenirs. Its really amazing. I really enjoyed this article as I am returning to Kolkata in mid February at the end of a long trip to India. I partially grew up in Kolkata in the time in which it was Calcutta and my grandparents are buried there and the paternal ones are buried in Asansol. There is a lot of our family history in Bengal also at Chandinagar with the French ancestors. I was given some Dokra craft at a conference in Edinburgh on 16th November 2017. Two beautiful big pieces which are pretty stunning…and heavy! I also recall the lovely textiles, and other beautiful crafts. I look forward to eating russigoolahs, mishti doi, bhekti fish, and would love some Bandel cheeses and also Aam sath, which is a sort of preserved mango that used to be sold in the New Market. It will be great to be back, I did write of my first return 20 years ago in my book India: The Peacock’s Call. I just wish the West Bengal Tourism Department had some energy and intiative…sadly no! Aline – you remind me of my few visits to Kolkata. I hope to go back and explore it more some time. I agree most tourism boards in India can do better. Hi Kankana, yes, I did miss out on Lal Pad Sari. Will add it in the next update. Probably missed it as I am yet to buy one for myself :-). Thanks for pointing out.